Jupiter's moon Ganymede is the largest satellite in the solar system. Larger than Mercury and Pluto, and only slightly smaller than Mars, it would easily be classified as a planet if were orbiting the sun rather than Jupiter. The moon likely has a salty ocean underneath its icy surface, making it a potential location for life. The European Space Agency plans a mission to Jupiter's icy moons that in 2030, is planned to arrive and put special emphasis on observing Ganymede. Age: Ganymede is about 4.5 billion years old, about the same age as Jupiter. Distance from Jupiter: Ganymede is the seventh moon and third Galilean satellite outward from Jupiter, orbiting at about 665,000 miles (1.070 million kilometers). It takes Ganymede about seven Earth-days to orbit Jupiter. Size: Ganymede's mean radius is 1,635 miles (2,631.2 km). Although Ganymede is larger than Mercury it only has half its mass, classifying it as low density. Temperature: Daytime temperatures on the surface average minus 171 degrees Fahrenheit to minus 297 F, and night temperatures drop to -193C. In 1996, astronomers using the Hubble Space Telescope found evidence of a thin oxygen atmosphere. However, it is too thin to support life as we know it; it is unlikely that any living organisms inhabit Ganymede. Magnetosphere: Ganymede is the only satellite in the solar system to have a magnetosphere. Typically found in planets, including Earth and Jupiter, a magnetosphere is a comet-shaped region in which charged particles are trapped or deflected. Ganymede's magnetosphere is entirely embedded within the magnetosphere of Jupiter. This montage compares New Horizons' best views of Ganymede, Jupiter's largest moon, gathered with the spacecraft's Long Range Reconnaissance Imager (LORRI) and its infrared spectrometer, the Linear Etalon Imaging Spectral Array (LEISA). Ganymede was discovered by Galileo Galilei on Jan. 7, 1610. The discovery, along with three other Jovian moons, was the first time a moon was discovered orbiting a planet other than Earth. Galileo's discovery eventually led to the understanding that planets orbit the sun, instead of our solar system revolving around Earth. Galileo called this moon Jupiter III. When the numerical naming system was abandoned in the mid-1800s, the moon was named after Ganymede, a Trojan prince in Greek mythology. Zeus, a counterpart of Jupiter in Roman mythology, carried Ganymede, who had taken the form of an eagle, to Olympus, where he became a cupbearer to the Olympian gods and one of Zeus' lovers. Several spacecraft have flown by Jupiter and its moons. Pioneer 10 arrived first, in 1973, followed by Pioneer 11 in 1974. Voyager 1 and Voyager 2 returned striking photos during their flybys. The Galileo spacecraft passed as low as 162 miles (261 km) over the surfaces of the Galilean moons and produced detailed images. The European Space Agency plans a mission called JUICE (JUpiter ICy moons Explorer) that would launch from Earth in 2022 for arrival at Jupiter in 2030. While the mission will look at three moons (Ganymede, Callisto and Europa), Ganymede will be the focus because it shows how icy worlds evolve and could be habitable in general, ESA said on its website. Scientists will try to figure out more about its ocean and icy crust, map its surface in detail, learn about the interior, probe the atmosphere and study the magnetic field. Ganymede has a core of metallic iron, which is followed by a layer of rock that is topped off by a crust of mostly ice that is very thick. There are also a number of bumps on Ganymede's surface, which may be rock formations. In February 2014, NASA and the United States Geological Survey unveiled the first detailed map of Ganymede in images and a video animation created using observations from NASA's Voyager 1 and Voyager 2 spacecraft, as well as the dedicated Jupiter-orbiting Galileo spacecraft. Ganymede's surface is made up of primarily two types of terrain: about 40 percent is dark with numerous craters, and 60 percent is lighter in color with grooves that form intricate patterns to give the satellite its distinctive appearance. The grooves, which were likely formed as a result of tectonic activity or water being released from beneath the surface, are as high as 2,000 feet and stretch for thousands of miles. 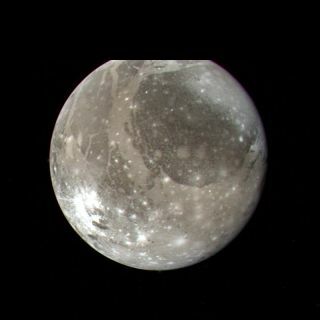 It is believed that Ganymede has a saltwater ocean below its surface. In 2015, a study by the Hubble Space Telescope looked at Ganymede's auroras and how they change between Ganymede's and Jupiter's magnetic fields. The “rocking” seen by the auroras gives evidence that the probable ocean underneath is salty, more salty than oceans of Earth, scientists said at the time. Some scientists are skeptical that Ganymede could host life, however. Due to its internal structure, it is believed that the pressure at the base of the ocean is so high that any water down there would turn to ice. This would make it difficult for any hot-water vents to bring nutrients into the ocean, which is one scenario under which scientists believe extraterrestrial life would occur.